"VERY STRONG drink - Similar to Long Island Iced Tea, but tastes much better to me, you don't taste the alcohol. You can adjust orange juice amount to adjust taste. Remember DO NOT drink and drive... This is a VERY strong drink but you don't taste the alcohol... fruity taste." Fill a pitcher with ice, and pour in the tequila, gin, rum, vodka, triple sec, orange juice, and grenadine. Stir to mix, then pour in beer to serve. Don't use 3.2% alcohol beer - real beer is best - Budweiser® or similar. I usually make a pitcher at a time in the summer. Use 4 to 5 ounces of each liquor, 16 ounces beer then add in orange juice until pitcher is 3/4 full then pour in grenadine until a dark reddish pink color. Top off remaining pitcher with orange juice. The reason this hasn't been reviewed is that after drinking just one of these, no one remembered. This was way too fruity and sweet for us. This drink is light and fruity but not too sweet. It is strong and it hits you later, sort-of like a good rum punch does. Fun and tasty drink but you have to like fruity. 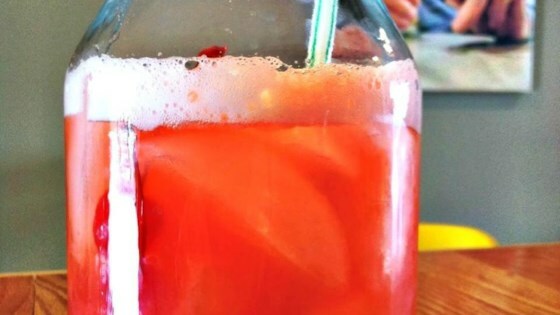 Awsome recipe.Here in Michigan we call this drink Sippy go Naked!We made this drink while camping with a group of friends.Never made it again! But it's always talked about every camping trip!